A dangerous/hazardous substance in the workplace is deemed any substance, in gas, liquid or solid form, including aerosols, fumes and vapours, that poses a risk to workers’ health or safety. Some potentially hazardous substances encountered in construction may include: asbestos (eg, pre-2000 insulation, guttering, roof or floor tiles); Respirable Crystalline Silica – RCS (dust from stone/cement/concrete); wood dust; solvents (paint, paint strippers, adhesives); lubricants or fuels; mineral fibres (rockwool insulation); fumes (welding); heavy metals (eg, lead, cadmium, mercury); isocyanates (paints, coatings, foams); and, carbon monoxide (eg, exhaust fumes from diesel-generators). Employers and employees need to ensure that care is taken to effectively manage hazardous substances in the workplace by first identifying the associated hazards, assessing the potential for exposure, and implementing appropriate control measures to protect persons and the environment. Where possible, hazardous substances and processes should be eliminated from workplaces (eg, designing new work processes). If elimination is not possible, risks must be managed based on a hierarchy of prevention measures detailed in Schedule 3 to the SHWW Act 2005. 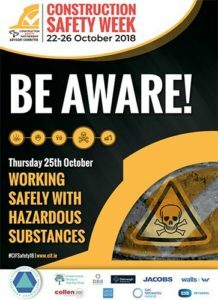 Additionally, the CIF has recorded a webinar on ‘Working Safely with Hazardous Substances’ with Paul O’Shea on behalf of the International Institute of Risk & Safety Management (IIRSM).